The Association is a centre of artists, as well as other appreciators of fine arts of various thematic interests and creative techniques. The Association became institutional first as the Amateur Association of Fine Arts of Niš "ADLUN" in 1969, under auspices of JNA Cultural Centre, along with the Association of Professional Artists, and after 1973, this Association came under auspices of the Association of Amateurs of Niš. The first President of the Association of Amateurs of Fine Arts of Niš was Živojin Lekiæ. After him, this Association was seccessfully headed, for almost ten years, by Ðorðe dr. Maèukanoviæ. These twu artists were the founders of the Association ADLUN (todey LUNA). In 1973 an outstanding exhibition of the members of the Association was held from 21st to 27th May, where 21 members exhibited their works. The interest of the visitors showed that the painting art can have promising future in our town. This Association has a corresponding social status and good artistic reputation, thanks to help and cooperation of competent institutions and individuals, on local as well as on the state level. Great help and support in the previously mentioned period, but also later on, was given by the Association of Amateur Artists of Niš, Cultural and Educational Society of Niš - KPZ, JNA Cultural Centre and Cultural Centre of Niš - NKC. On the level of Republic of Serbia, our Association was helped by: the Associoation of Amateurs of Serbia, by organizing REPUBLIC REVIEWS OF FINE ARTS, as well as by organizing painting colony "17 watermills" in Donji Dušnik (founded in 1977). The mentioned reviews, where the most successful members of ADLUN / LUNA take part, are held every year (since 1980). The third review of Amatereus of Fine Arts of Serbia was held in Niš from 25th October to the 1st November, 1983 organised by: the Association of Amateurs of Serbia, Association of Amateur Artists of Niš and Cultural Centre "Josip Kolumbo" from Niš, where 86 artists from entire Serbia took part. Niš was represented by four painters and five sculptors from "ADLUN", the fact thet speaks for itself and underlines the outstanding participation of our Association, noticed by its artistic achievements. It is interesting to mention that the Association itself, as well as the remarkable individuals had a number of successful contacts with other Associations and artists. So, our Association realized the cooperation with our outstanding painter in the 80's of the last century, Miliæ from Maèva (Miliæ Stankoviæ), through a group of our surrealists headed by the painter Siniša Stamenkoviæ. Analysing the achieved quality of works of our members, it is worthwhile mentioning the professional opinion of our art historian Vojislav Deviæ who, in the catalogue from 1981 said: "Among amateurs of Niš today, there are some who can be equalled with professional artists... 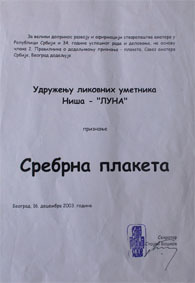 Some members of the Association were rewarded for the achieved high level of artists work at Yugoslav Amateur Reviews". During four decades, about 350 artists of the Association exhibited their works at collective and individual exhibitions. 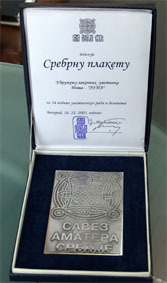 We are proud to mention that the Association 2003, was awarded SILVER PLAQUE OF THE ASSOCIATION OF AMATEURS OF SERBIA for 34 years of artistic work and the achieved results in fine arts. We truly believe that the city of Niš can be proud of such achievements, regardless of the fact that our Association never asked for more than it can get from the City and that no amatereurism, including fine arts, gets appropriate treatment in valuing the quality. In any case, our Association has two basic harmonized coordinates: in creative aspect - to achieve the highest artistic expression and experience, and in social one - the motto is: happiness is to create, to associate, to help each other, to enjoy creative work of your own, and work of others. Copyright © 2017, Webmaster: Suzana Rajković . All Rights Reserved.